Theyyams and Sthanas have a close relationship with certain trees and plants. It is believed that certain branches of the trees are the places of Gods and Godesses. Pala, Champakam, Al, Jackfruit tree are the place of Godesses. Kanhiram, Elangi, Arayal etc. are some of the common trees found near Temples and Sthanas. Few other devine trees are Coconut trees, Edala, Poovam, Nalli, Punna, Kaitha etc. It is very rare to see a shrine without a sacred tree or a sacred grove. These are inevitable part of a shrine. People believe that these trees are the abode of many divine beings. There are special kind of poojas and rituals are conducting to safeguard such trees and groves. Its number may vary from shrine to shrine and many have a patches of such vegetation called ‘Sacred Groves”. Groves are the symbol of how nature related with divine God. The flora and fauna worship includes snakes, birds, fishes, and even wild animals. The famous theyyam cult Nageni Amma performs in front of the sacred grove to propitiate the God snake. Sacred trees are patches of natural vegetation which are surviving near the shrines, groves temples. There are well protected by devotees believing that preserving such vegetation in rarely undisturbed states is necessary for expressing one’s relation to the divine or to nature. It may be assumed that traditional Hindu society recognized certain individual species as objects of worship, based on accumulated ancient knowledge and their identified value for specific use. Instead of single species people sometimes used to worship certain patches of as sacred. As more and more natural vegetation is lost in the inhabited areas the remaining patches of forests in the form of sacred groves come to acquire a crucial role in buffering biodiversity. Thus sacred groves acquire importance from the point of view of ecology and conservation of biological diversity. Many of the sacred groves remain well protected by means of myths and taboos. Natural vegetation consists of different types of forests. In spite of the generally uniform climate conditions, vegetation is diverse. In certain restricted regions with their own microclimate or special surrounding features, it varies from mangroves to rain forests. Mangrove vegetation is another conspicuous feature of this zone. Natural vegetation in the midland is restricted to the riverside and certain pockets in other regions. Sacred groves are abundant in Kannur district. The sacred forest of this region are ecologically better from wet evergreen and semi evergreen to deciduous. Usually they considers as a centre of biodiversity. Usually the sacred groves are of three types Daivakkavu, where male God is worshiped, Bhagavathikkavu, where a female God is worshipped and Nagam or Sarppakkavu, where snakes are worshipped. Many of them have small shrines attached to them. Complex rituals are performed in almost all of those groves which include periodical performance of “Theyyam”. Shrines are present in association with many sacred groves of Gods and Goddesses. But some of them have only a small holy place in the form of a stone, idol or platform or a single tree for worship. The term “Mundys” is also used for sacred forest of God worship. At present in many cases Kavus or Mundyas have turned to be simply shrines with few trees in place of the green vegetation. The famous shrine Thayakkavu in Thekkumbad, Kannur District is the only grove with mangrove vegetation. The wet tropical climate of the locality supports growth of evergreen species, resulting in the majority of the groves having evergreen vegetation. Single trees worshipped are all of the evergreen type. Religion played an important rock in preserving groves. 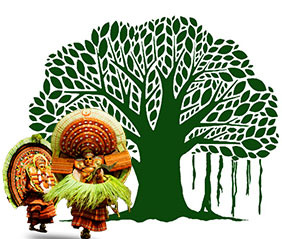 Hindu way of worship incorporated many cults related to trees and nature. Temples were built around a sacred place as a centre of worship. The community was constantly guided to protect such groves. A number of legends grew up telling the terrible things that happened to those who violated their sanctity.